Deliver a research journal about trolls. 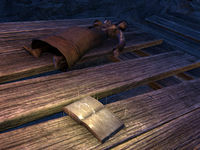 I discovered a research journal kept by an Orc named Grularz in Crestshade Mine. She was apparently studying the trolls until they decided to kill her. The journal referred to a brother named Gothurg in Shornhelm. Venture into the Crestshade Mine and read the research notes on the behavior of trolls. Bring the notes to Gothurg in Shornhelm. Finishes quest I should find Gothurg in Shornhelm and give him Grularz's journal. This page was last modified on 16 December 2017, at 22:21.